A pair of Fed regional manufacturing reports came out this morning. Both show contraction. The Empire State Index came in at -11.36, worse than any economist's estimate. The Econoday Consensus Estimate was -7 and the range was -5 to -10. Minus signs sweep the Empire State report with the headline at minus 11.36 which is more than 1 point below Econoday's low end estimate. Looking at individual readings, new orders are in very deep trouble at minus 18.92 for a fifth straight month of contraction. And manufacturers in the region are not going to be able to turn to unfilled orders to keep busy with this reading extending a long string of contraction at minus 15.09 in September. Lack of orders is showing up in shipments, which are at minus 13.61 for a third straight contraction, and in employment which is in a second month of contraction at minus 8.49. The workweek is down and delivery times are shortening, both consistent with weakening conditions. Price data show a second month of contraction for finished goods, which is another negative signal, and a narrowing and only marginal rise for prices of raw materials. 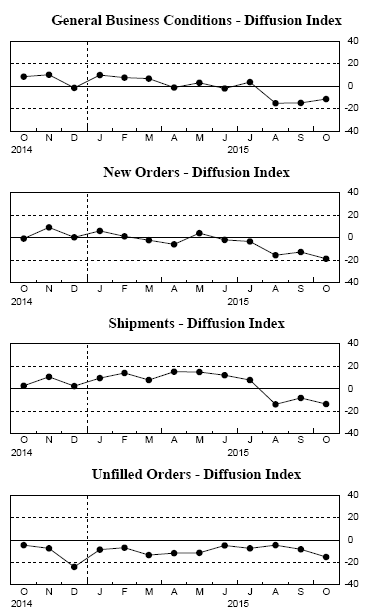 Diving into Empire State Manufacturing Report details we see "new orders, shipments, and unfilled orders all declined at a steeper pace than last month. Price indexes suggested that input prices held steady, while selling prices declined at the fastest pace since 2009. Labor market indicators pointed to a continued decline in employment levels and hours worked." At least the economists got the negative sign correct.